There’s a reason retaining walls are so popular in both residential and commercial landscaping – several reasons in fact.They provide the chance to inject beautiful stonework and hardscaping into the area and allow you to transform your landscape in tiers around central features (by using flowerbeds and/or gardens) One of the most important purposes is their ability to save a yard by preventing soil erosion and managing your rainwater flow. Below are four of the most common types of retaining walls, what situation they are good for, and the amount of work that goes into each. The most basic of retaining walls, the gravity retaining wall uses sheer weight and mass to hold the soil at bay. Since it’s mostly about weight, these retaining walls allow for the widest amount of variety when it comes to materials. 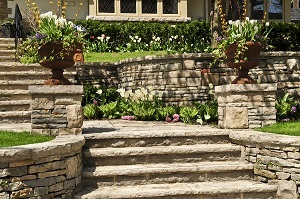 Bricks, pavers, and unmortared stone are just a few options available, and dry-stacked stone is a very popular choice. While shorter walls require no additional reinforcement, most will require at least a small trench to be dug for the wall to fit into, and some may require a concrete footer to sit on. Sometimes called a reinforced retaining wall from the steel bars that run through the concrete or masonry retaining wall, the cantilevered retaining walls makes use of a retaining wall affixed to a slab foundation that goes under the soil the wall is supporting in an “L” shape. The weight of the above soil holds the slab down so that the wall cannot tip forward. This style is favored in commercial retaining walls for its strength. A “counter-fort” or “buttressed” retaining wall includes additional vertical wings to the foundation that provides additional strength and rigidity. A very basic kind of wall usually used when space is an issue, a sheet pile retaining wall is a thin wall of steel, wood, or vinyl that is driven directly into the soil. Often these have a vertically corrugated structure to provide additional reinforcement. These pilings only work in softer soils, and a good rule of thumb is that you have to get one-third of the sheet piling driven into the ground for every two-thirds that will be above it. Larger walls will require additional anchoring such as anchored retaining walls (see below). An anchored retaining wall allows for a variety of “fronts” of retaining walls to be supported by anchors driven into the earth behind them and attached by cables or strips. These anchors are usually mechanically driven into the ground and their ends expanded by injecting pressurized concrete or mechanical means. You can use this method to provide additional support to any of the above options and is often used for structurally thinner walls or where higher loads are expected. At Greener Horizon we’re experts when it comes to landscaping and hardscaping in the New England area. Want to learn more? Contact us to learn more about our services in your area and get a complimentary consultation on retaining wall installation.